Declan Bonner says his Donegal side remain in with a "big chance" of returning to Division One after Saturday's narrow win over Armagh. Donegal's 1-9 to 0-11 win in Ballybofey kept them within two points of leaders Meath and Fermanagh, who occupy the promotion places with two rounds left. However, Meath host Fermanagh in the final round which could potentially open the door to Donegal. "If we can keep up our end of it, we still have a big chance," said Bonner. "We have two matches left. Cork [away] and Kildare [home]. There's a lot of teams that have taken points off each other." After second-half collapses saw Donegal slip to disappointing defeats by Tipperary and the Ernemen, Bonner's men had to win Saturday night's game to keep their hopes of alive of an immediate return to Division One after last Spring's surprise relegation. 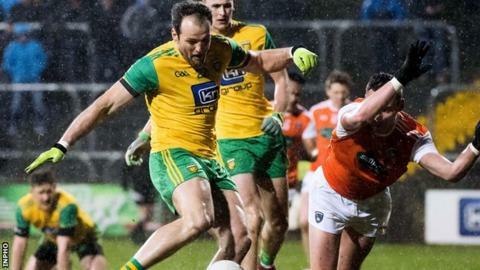 Donegal had to sweat in the closing stages as they saw a seemingly comfortable four-point advantage trimmed to the minimum before Martin McNally blew the final whistle. However, Bonner insisted on focusing on the positives following the win as he lauded his team's resolve following the two recent setbacks. "The lads showed great character - especially in the first half against the elements. "They dug in and we held on. We didn't make it easy for ourselves in the second half but we got the two points which was exactly what we wanted out of the game. "The character was good, especially in the first half, and it sets us up for Cork in two weeks' time." Donegal's talisman Michael Murphy hit the crucial goal before half-time six minutes after coming on as a substitute for his first involvement in this year's league and other experienced men Paddy McGrath, Neil McGee and Frank McGlynn could also bolster Bonner's squad in the closing two rounds. "It's great to get Michael back on the pitch and Paddy McGrath, Neil and Frank McGlynn are all chomping at the bit to get back as well, so there's a lot of experience to come back into the squad. "Our young guys will have gained a lot of learning experience from particularly the last two matches against Tipperary and Fermanagh but with Michael's leadership there again, it will make it a bit easier for us." However while Donegal are back in promotion contention after Saturday's win, Bonner will surely be mindful his team are facing a Cork side who on Saturday managed what they couldn't achieve three weeks ago by winning at Semple Stadium. Cork remain bottom of the table despite their win over Tipperary but the Rebels are now level on points with Tipp and Clare and two closing victories over Donegal and Armagh will ensure their Division Two survival.